We, Brentorma Electricals (Shenzhen) Co. Ltd, are one of the leading companies in designing and manufacturing bottled and point of use water dispensers (also known as water coolers) in mainland China. We also manufacture domestic water filters and purifiers. Our professionalism and high quality products earn a high degree of respect overseas and domestically. Our R&D team is strong, dedicated and well-seasoned - most of them have been working in this field for over six years. Our engineers pay close attention to detail in the innovation and production of our products. As an ISO 9001:2000-certified enterprise, we prioritize quality to continue the first-rate reputation we’ve gained in the market. We conduct a rigorous quality assurance system where each product must pass visual, performance and safety inspections. Additionally, individualized serial numbers track the location and servicing of products throughout its lifespan. Accordingly, in the past years, we've kept internationally renowned companies as long-term partners which include companies such as Mitsui, Asahi, Support Plus, Grainger and Nestlé Waters. 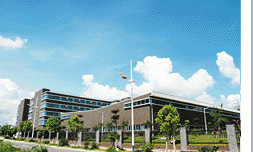 Our headquarters and manufacturing site are located in Shenzhen, which is roughly 30 minutes drive from Hong Kong. The site totals an area of 6,000 square meters in Guanlan High-tech Industrial Zone. Our products export to more than 30 countries and regions. Every month, approximately 10,000 CE-marked water dispensers are sold overseas. Also, our best sellers boast GS, UL and C-UL approvals. Aiming for leadership in industry innovation, we endeavor to offer the highest quality products using the latest technology to customers worldwide. Our goal is to bring our products to people all around the world, and to become a first-class OEM and ODM supplier in the world. We have a division of commercial equipment - Calmus Machinery who provides a complete solution for the drinking water and beverage industry. For details, please visit www.calmusmachinery.com .